Eruption is a series of unique, complex events with an eruptive movement of tooth germ from its developmental position in the alveolar crypt of the jaw into its functional position of the oral cavity. Any form of interruption, such as genetic or environmental causes, towards this process will result in dental anomalies. Dental anomalies are very commonly observed in orthodontic patients. Several studies have been conducted for the prevalence of various dental anomalies worldwide. Uslu et al. examined selected pre-treatment diagnostic records and reported that 40.3% of 636 orthodontic patients had at least one dental anomaly. They added that orthodontic patients have a significantly high incidence of this condition. In a study conducted on an Indian population, 31.26% presented with dental anomalies. Udom et al. recorded 74.8% of 111 orthodontic patients who had at least one dental anomaly. In the North Greek population, at least 13.7% of 1239 examined radiographs of patients in the Aristotle University School of Dentistry, having at least one impacted tooth. A remarkably high rate of dental anomalies was recorded in orthodontic patients; therefore, orthodontists should carefully examine pre-treatment records for dental anomalies to include their management in the treatment planning. There is lack of study regarding tooth anomalies in orthodontic patients and none have reported on the treatment for patients with anomalies in this country. The aim of this research is to conduct a retrospective study of the prevalence of dental anomalies (impacted teeth, supernumerary, hypodontia, supraocclusion, infraocclusion, and any other anomalies observable, excluding third molars) among orthodontic patients in orthodontics dental clinics, and the treatments planned. As several classifications of dental anomalies are available, each of them affects the dentition in a distinct pattern. Some of these anomalies play a great role in occlusion and alignment of the tooth, which will affect orthodontic treatment planning, thus resulting in treatment relapse. A total of 370 randomly selected dental records including pre-treatment orthopantomographs (OPG) and study models of orthodontic patients that satisfy the inclusion criteria were retrospectively assessed for impaction, hypodontia, supernumerary, supraocclusion, infraocclusion, and any other anomalies assessable. Third molars were excluded from this study. The records were retrieved from the orthodontic archive of the selected hospital. Where n is the sample size and p is the true proportion. P value was obtained to be 40.3% based on the occurrence of at least one type of dental anomaly in the orthodontic patients. The precision value (E) was set at 0.05. Z value is 1.96, for 95% confidence interval (CI), which is conventional. Thus, 370 records that favour both inclusion and exclusion criteria were randomly selected. This study includes the patients of permanent dentition only. Any subjects with a significant medical history, syndromic patient, history of congenital anomalies such as cleft lip or/palate, history of permanent tooth extraction, dental trauma, and previous prosthodontic treatment before orthodontic treatment were excluded. Subjects with spoiled or damaged radiographic images and the study models were purposely excluded as well to reduce misinterpretation. The subjects' folders were retrieved from the record unit to ensure accurate medical history and any dental treatment they underwent. All the records were examined by a single investigator and intra-examiner reliability was tested with random re-examination by an experienced orthodontist. Ethical approval was obtained from the Human Research Ethics Committee of the institutions (USM/JEPeM/16030126). Data collection was pooled and analyzed by IBM Statistical Packages for Social Sciences (SPSS) for Windows software version 22.0 (SPSS Inc., Chicago, Illinosis, USA). Descriptive statistical analysis was performed to assess the frequency of anomalies, tooth type involved, location of anomalies occurrence and types of treatment planned for subjects with anomalies. The association of anomalies with gender status and racial status was analyzed using Pearson's Chi-square test. A P value of <0.05 is considered significant. Out of 370 randomly selected subjects, 105 (28.4%) exhibited at least one dental anomaly. [Table 1] outlines the prevalence and distribution of dental anomalies. However, this amount overlapped as multiple anomalies were evident in 20 (5.4%) cases [Table 2]. The prevalence of male subjects (30.8%) with dental anomalies was higher than that of females (27.84%), but there was no significant association between dental anomalies and gender status using Pearson's Chi-square test. (P = 0.503). The distribution is shown in [Table 3]. Our findings showed a significant association between dental anomalies and race using Pearson's Chi-square test (P = 0.006). More Malay subjects have dental anomalies compared to Chinese [Table 4]. A total of 53 subjects (14.32%) have at least one impacted tooth. However, the total impacted teeth was 71, as 14 (26.41%) of the subjects presented with more than one impacted tooth. The frequency is shown in [Figure 1]. The most impacted teeth were the maxillary canines, followed by mandibular second premolars. The most impacted teeth were seen in the maxillary anterior region as well. The prevalence of hypodontia was 7.03% (26 subjects). Twelve (46.15%) of the subjects with hypodontia presented with more than one congenitally missing tooth [Figure 2], thus the total missing teeth were 42. The most congenitally missing teeth were the mandibular laterals, followed by mandibular premolars. Hypodontia occurs most frequently in the mandibular anterior sextant. Compared to the maxillary arch, the teeth in the mandibular arch region were missing. Supernumerary was seen in 10 subjects (2.7%), wherein mesiodens were evident in four subjects (1.08%). Supernumerary teeth are more frequent on the maxillary arch compared to the mandibular arch. Seven (1.89%) individuals have supraoccluded tooth, mostly on the maxillary posterior right sextant. Infraocclusion occurs in 3.78% (14 subjects) of the population, and maxillary second molars are the most commonly affected ones. Three subjects have bilateral supraoccluded maxillary second molar. Peg-shaped teeth were present in 15 subjects (4.05%), among which nine (2.43%) have bilateral peg-shaped teeth. Fourteen cases are maxillary peg laterals. One subject has bilateral peg-shaped canine. All peg-shaped teeth constitute the maxillary anterior region. Microdontia was evident in four patients (1.08%), among whom two presented with generalised microdontia. One subject has microdontic 12 and another both microdontic 12 and 22. One subject presented with dilacerations (0.27%) and another with generalised enamel hypoplasia (0.27%), which are the least common anomalies. Overall, the most common teeth presented with anomaly are 12 and 23. The most common occurrence of anomaly is in the maxillary anterior region. Our research objectives also include the types of treatment planned in the HUSM Orthodontic Unit to patients with dental anomalies. 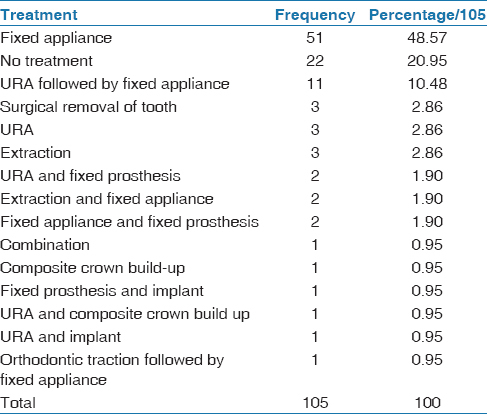 Out of 105 subjects, 51 (48.67%) were treated with a fixed appliance. The treatments planned for these patients are outlined in [Table 5]. Our findings demonstrated 28.4% subjects with at least a single anomaly, at a very close range with the Norway and Iran population, at 28.2 and 29%, respectively., However, both studies included those in mixed dentition. Uslu et al. reported a higher rate of 40.3% in a study among orthodontic patients with permanent dentition, which has been included in this study as well. This number can be attributed to the differences in the diagnostic criteria, as they include wisdom teeth, commonly recognised to exhibit anatomic variations. Statistically significant correlation was evident between race and dental anomalies, such that the prevalence was higher among the Malays (32%) as compared to Chinese (18.4%). Dental anomalies are caused by complex multifactorial interactions between genetic, epigenetic, and environmental factors during the long process of dental development. It explains this phenomenon, as different races carried different genetic coding. Several studies concluded that hypodontia was the most prevalent dental anomaly,,,, and this phenomenon is a result of disturbances during the early stages of development. A survey done by Rakhshan, analyzing the previous reports varying in size from about 200 subjects to about + 100,000, revealed that the prevalence of agenesis in the permanent dentition excluding the third molars ranged between 0.15 and 16.2%. Although this phenomenon of tooth agenesis was not the most evident anomaly in our findings, it was observed in 26 subjects (7.03%), within the range stated above. 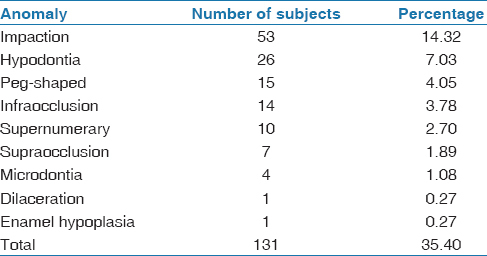 Our hypodontia prevalence is not far deviated from the Iranian orthodontic population (9.1%), where the research is conducted among 1, 751 subjects. Twelve subjects presented with more than one missing tooth in our study. According to Citak, the most common anomaly associated with agenesis was the agenesis of another tooth. The finding that maxillary laterals were most frequently missing in the arch was consistent in the previous studies that excluded third molars.,,,,,, Interestingly, in contrast to previously reported, the incidence of missing mandibular laterals is most significant in our study. This study also deduced that agenesis is of higher occurrence in the mandibular arch, contradictory to the findings among the Iranian populations, wherein more missing teeth were found on the maxillary arch., Although the predominant etiology of hypodontia is genetic, such variation could be attributed to the environmental factors such as fractures, surgical removal, and extraction of primary teeth. The prevalence of peg-shaped tooth in this study (4.05%) was higher than that reported by the overall average in the general population, at 1.8%. Gupta et al. and Altug-Atac and Ederm concluded that maxillary laterals were the most affected and bilateral peg-shaped tooth are more commonly seen compared to unilateral, similar to our study., Interestingly, a subject presented with bilateral peg-shaped maxillary canine in our investigation. A study carried out in an Iranian orthodontic population revealed that the prevalence of peg-shaped maxillary laterals was 1% lower than our finding (3.78%). Citak discovered that agenesis is often associated with maxillary peg laterals. Two of our cases of maxillary peg laterals coexist with hypodontia. Infraocclusion is a common eruption disturbance, which constitutes a major clinical problem. The core of this condition is ankylosis of the tooth or its dentoalveolar tissue. Fourteen subjects (3.78%) presented with this anomaly. The range of prevalence of infraocclusion is very wide, in general between 1.3 and 38.5%. The mandibular deciduous second molar was the most frequently infraoccluded tooth, and 99% of the subjects presented with this condition. Studies on the prevalence of this condition among permanent tooth are lacking. Compagnon and Woda observed cases of supraeruption of the maxillary first molar in the absence of the mandibular first molar in subjects with pathological and non-pathological periodontium. They concluded that supraeruption of a tooth is the sequelae of loss of opposing contact where the crown erupted beyond the occlusal plane and active eruption took place. Supraocclusion was seen in seven subjects (1.89%) in this study. Angle in 1907 expressed that a tooth could be maloccluded in any one of the seven positions or combinations of positions; two of them are supraocclusion and infraocclusion. A combination of both supraocclusion of incisors and infraocclusion of molars will result in dentoalveolar deep bite. Four subjects have microdontia (1.08%). The rate is between 0.7 to 12.3% among the orthodontic patients.,,, In the Saudi population, microdontic maxillary laterals were most prevalent. In our study, other than generalised microdontia, the rest exhibited microdontic maxillary laterals. Dilacerations was the least common anomaly in our study, wherein it was seen in only one subject (0.27%). Ghabanchi J et al. stated that dilacerations was the less common anomaly (1.44%). In a southeast Iranian population, dilacerations was the second most common dental anomaly (5.29%). A higher prevalent (4.3%) compared to our finding was also recorded among orthodontic patients in the Aga Khan University Hospital. The diagnosis of this anomaly is crucial prior to root canal treatment procedures, exodontia, and also orthodontic movement. Root dilacerations on mesial or distal direction are observable on radiograph but not those towards buccal and lingual. Additional X-ray of different angles will aid the detection of dilacerations. Enamel hypoplasia is defined as a deficiency in enamel thickness resulting from a disruption in the matrix apposition stage of tooth enamel development. Goodman and Rose stated that the percentage of individuals with hypoplasia was predominantly less than 10% in most populations of well-developed industrial countries. In this study, only one subject presented with this defect. Hypocalcemia has also associated with the occurrence of enamel hypoplasia in the permanent dentition in hereditary vitamin D-resistant rickets, X-linked hypophosphatemia, and hypoparathyroidism. Nevertheless, any patients with significant medical illness were excluded from this study. Dental anomalies often result in malocclusion and interfere with function, speech, and aesthetics. Thus, appropriate treatments are deemed necessary to correct or improvise this condition. There is a lack of studies on treatments for patients with dental anomalies in their population. According to our results, the majority of patients (79.05%) with anomalies were planned for various treatments, mostly fixed appliances. The anomalies may cause other teeth in the arch to be extruded, intruded, rotated, overbite, and space in the arch, especially due to hypodontia. Such conditions can be corrected by a fixed appliance, as it enables not only vertical and tilting movement of a tooth but also rotational and apical movements. This treatment is indicated when precise tooth movements are required. Surgical tooth removal, normal extractions, and URA are planned for 2.85% of the sample each. Tooth removal is often indicated when it presents with complication or any associated pathology and aesthetics concern, particularly in case of mesiodens. The remaining 20.95% are not planned for treatment, as no treatment is also a treatment option. Variations of prevalence of dental anomalies were observed in different populations.,,,,, Such discrepancies are tenable by different study materials, sample sizes, diagnostic criteria, sampling techniques, as well as environmental and racial factors. However, our results cannot be compared to other populations in Malaysia, as there is a lack of study regarding this phenomenon. Thus, more researches shall be conducted to study the prevalence of dental anomalies among various populations in this country, so any disparity between different regions can be further investigated. The etiology or the risk factors of anomalies has to be scrutinized further, such that it can be prevented at an earlier developmental stage. The prevalence of dental anomalies among the orthodontic population is 28.4%, where impaction was the most prevalent, followed by hypodontia. Dilacerations and hypoplasia are the least common anomaly. The maxillary canines and laterals are the most frequently to exhibit anomalies and thus most anomalies are observed on the anterior maxillary region. Statistical analysis indicated that dental anomalies are dependent on race, but independent of gender. The most common treatment planned for these patients is fixed appliance. We believe that the variations among prevalence of other population are caused by racial and environmental variations, as well as the diagnostic criteria. These anomalies play a great role in occlusion and alignment of the tooth, which will affect the orthodontic treatment planning and it might result in treatment relapse if not being considered carefully. The authors would like to acknowledge the staffs in the radiographic department, orthodontic department and record unit of the institutions for their kind assistance in providing materials and facilities for this study. The work was supported by RUI Grant from Universiti Sains Malaysia (1001/PPSG/8012216). Berkovitz BK, Holland GR, Moxham BJ. Development of the dentitions. In: Berkovitz BK, Holland GR, Moxham BJ, editors. Oral anatomy, embryology, and histology, 4th ed. Edinburgh: Mosby; 2009. p. 358. Al-Jabaa AH, Aldrees AM. Prevalence of Dental Anomalies in Saudi Orthodontic Patients. J Contemp Dent Pract 2013;14:724-30. Uslu O, Akcam MO, Evirgen S, Cebeci I. Prevalence of dental anomalies in various malocclusions. Am J Orthod Dentofacial Orthop 2009;135:328-35. Gupta SK, Saxena P, Jain S, Jain D. Prevalence and distribution of selected developmental dental anomalies in an Indian population. J Oral Sci 2011;53:231-8. Thongudomporn U, Freer TJ. Prevalence of dental anomalies in orthodontic patients. Aust Dent J 1998;43:395-8. Fardi A, Kondylidou-Sidira A, Bachour Z, Parisis N, Tsirlis A. Incidence of impacted and supernumerary teeth-a radiographic study in a North Greek population. Med Oral 2011;16:e56-e61. Aren G, Güven Y, Tolgay CG, Ozcan İ, Bayar ÖF, Kose TE, et al. The prevalence of dental anomalies in a Turkish population. J Istanbul Univ Fac Dent 2015;49:23-8. Sogra Y, Mahdjoube GM, Elham K, Shohre TM. Prevalence of dental anomalies in Iranian orthodontic patients. J Dent Oral Hygiene 2012;4:16-20. Khan SQ, Ashraf B, Khan NQ. Prevalence of dental anomalies among orthodontic patients. Pak Oral Dent J 2015;35:224-7. Haugland L, Storesund T, Vandevska-Radunovic V. Prevalence of Dental Anomalies in Norwegian School Children. Open J Stomatol 2013;03:329-33. Vani NV, Saleh SM, Tubaigy FM, Idris AM. Prevalence of developmental dental anomalies among adult population of Jazan, Saudi Arabia. Saudi J Dent Res 2016;7:29-33. Afify AR, Zawawi KH. The Prevalence of Dental Anomalies in the Western Region of Saudi Arabia. ISRN Dent 2012;1-5. Desai RS, Vanaki SS, Puranik RS, Rashmi GS, Nidawani P. An unusual combination of idiopathic generalized short-root anomaly associated with microdontia, taurodontia, multiple dens invaginatus, obliterated pulp chambers and infected cyst: A case report. J Oral Pathol Med 2006;35:407-9. Suprabha BS, Sumanth KN, Boaz K, George T. An unusual case of non-syndromic occurrence of multiple dental anomalies. Indian J Dent Res 2009;20:385-7. Brook A. Multilevel complex interactions between genetic, epigenetic and environmental factors in the aetiology of anomalies of dental development. Arch Oral Biol 2009;54:S3-S17. Herrera-Atoche JR, Diaz-Morales S, Colome-Ruiz G, Escoffie-Ramirez M, Orellana MF Prevalence of dental anomalies in a Mexican population. Dent 3000 2014;2. Hou R, Kong L, Ao J, Liu G, Zhou H, Qin R, et al. Investigation of impacted permanent teeth except the third molar in Chinese patients through an X-ray study. J Oral Maxillofac Surg 2010;68:762-7. Kramer RM, Williams AC. 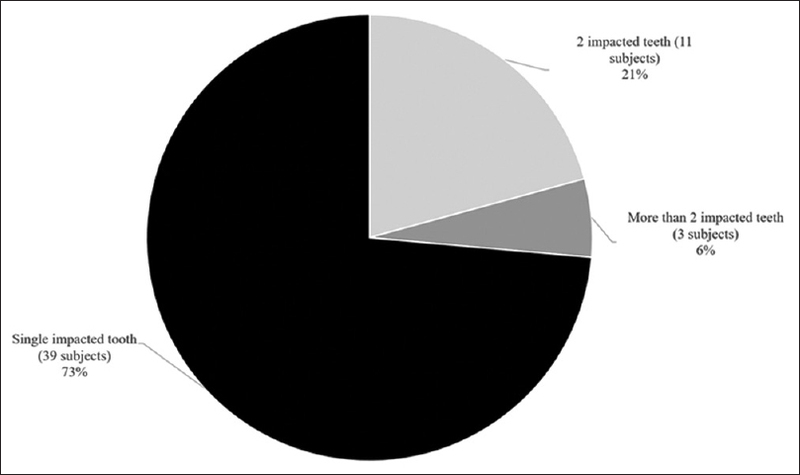 The incidence of impacted teeth. A survey at Harlem hospital Oral Surg Oral Med Oral Pathol 1970;29:237-41. Grover PS, Lorton L. The incidence of unerupted permanent teeth and related clinical cases. Oral Surg Oral Med Oral Pathol 1985;59:420-5. Dachi SF, Howell FV. A survey of 3, 874 routine full-month radiographs. II. A study of impacted teeth. Oral Surg Oral Med Oral Pathol 1961;14:1165-9. Roberts-Harry D, Sandy J. Orthodontics. Part 10: Impacted teeth. Br Dent J 2004;196:319-27. Altug-Atac AT, Erdem D. Prevalence and distribution of dental anomalies in orthodontic patients. Am J Orthod Dentofacial Orthop 2007;131:510-4. Fekonja A. Hypodontia in orthodontically treated children. Eur J Orthod 2005;27:457-60. Aktan AM, Kara IM, Şener İ, Bereket C, Ay S, Çiftçi ME. Radiographic study of tooth agenesis in the Turkish population. Oral Radiol 2010;26:95-100. Rakhshan V. Congenitally missing teeth (hypodontia): A review of the literature concerning the etiology, prevalence, risk factors, patterns and treatment. Dent Res J 2015;12:1-13. Citak M, Cakici EB, Benkli YA, Cakici F, Bektas B, Buyuk SK. Dental anomalies in an orthodontic patient population with maxillary lateral incisor agenesis. Dent Press J Orthod 2016;21:98-102. Kennedy DB. Orthodontic management of missing teeth. J Can Dent Assoc 1999;65:548-50. Al-Emran S. Prevalence of hypodontia and developmental malformation of permanent teeth in Saudi Arabian schoolchildren. Br J Orthod 1990;17:115-8. Schalk-van der weide Y. Oligodontia. A clinical, radiograph and genetic evaluation (Thesis). Utrechy, The Netherlands: University of Utrecht; 1992. Kositbowornchai S, Keinprasit C, Poomat N. Prevalence and distribution of dental anomalies in pretreatment orthodontic Thai patients. KDJ 2010;13:93-100. Rajab LD, Hamdan MAM. Supernumerary teeth: Review of the literature and a survey of 152 cases. Int J Paediatr Dent 2002;12:244-54. Díaz A, Orozco J, Fonseca M. Multiple hyperdontia: Report of a case with 17 supernumerary teeth with non syndromic association. Med Oral Patol Oral Cir Bucal 2009;14:E229-31. Rao PV, Chidzonga MM. Supernumerary teeth: Literature review. Cent Afr J Med 2001;47:22-6. Hua F, He H, Ngan P, Bouzid W. Prevalence of peg-shaped maxillary permanent lateral incisors: A meta-analysis. Am Journal Orthod Dentofacial Orthop 2013;144:97-109. Petcu A, Maxim A, Pasareanu M, Savin C. Relevance of primary molars in development of occlusion in mixed dentition. Romanian J Oral Rehab 2009;1:16-9. Altay N, Cengiz SB. Space-regaining treatment for a submerged primary molar: A case report. Int J Paediatric Dent 2002;12:286-9. Shalish M, Peck S, Wasserstein A, Peck L. Increased occurrence of Dental Anomalies Associated with Infraocclusion of Deciduous Molars. Angle Orthod 2010;80:440-5. Compagnon D, Woda A. Supraeruption of the unopposed maxillary first molar. J Prosthetic Dent 1991;66:29-34. Angle EH. Treatment of malocclusion of the teeth: Angle's system. S.S. White Manufacturing Co, Philadelphia; 1907. Premkumar S. Synopsis of treatment planning for different malocclusions. In: Premkumar S, editor. Textbook of orthodontics. New Delhi, India: Elsevier; 2015. p. 733. Ghabanchi J, Haghnegahdar AA, Khodadazadeh Sh, Haghnegahdar S. A Radiographic and Clinical Survey of Dental Anomalies in Patients Referring to Shiraz Dental School. Shiraz Univ Dent J 2010;10:26-31. Ebrahimipour S, Saberi E. Evaluation of developmental dental anomalies in digital panoramic radiographs in Southeast Iranian Population. J Int Soc Prev Community Dent 2016;6:291-5. Rathi MK, Fida M. Pattern of Dental Anomalies in Orthodontic Patients at a tertiary Care Hospital. J Pak Dent Assoc 2013;22:226-8. Lorena SC. Multiple dental anomalies. J Oral Sci 2003;45:47-50. Lanphear KM. 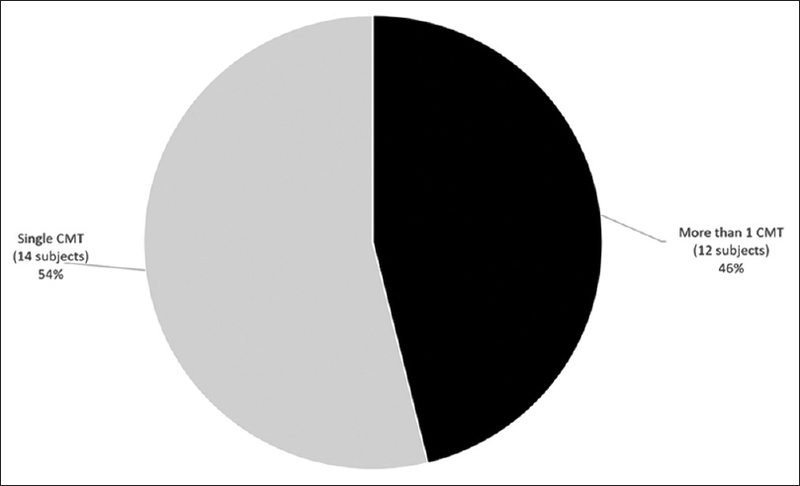 Frequency and Distribution of Enamel Hypoplasia in a Historic Skeletal Sample. Am J Phys Anthrop 1990;81:35-43. Goodman AH, Rose JC. Dental Enamel Hypoplasias as Indicators of Nutritional Status. Adv Dent Anthrop 1991;5:225-40. Zambrano M, Nikitakis NG, Sanchez-Quevedo MC, Sauk JJ, Sedano H, Rivera H. Oral and dental manifestations of vitamin D-dependent rickets type I: Report of a pediatric case. Oral Surg Oral Med Oral Pathol Oral Radiol Endod 2003;95:705-9. Mitchell L. Fixed appliances. In: Mitchell L, editor. An introduction to orthodontics. 3rd ed. Oxford: Oxford University Press; 2007. p. 191-2. Littlewood SJ, Tait AG, Mandall NA, Lewis DH. Orthodontics: The role of removable appliances in contemporary orthodontics. BDJ 2001;191:304-10. Sujon MK, Alam MK, Rahman SA. Prevalence of Third Molar Agenesis: Associated Dental Anomalies in Non-Syndromic 5923 Patients. PLoS One 2016;11:e0162070. Vahid-Dastjerdi E, Borzabadi-Farahani A, Mahdian M, Amini N. Non-syndromic hypodontia in an Iranian orthodontic population. J Oral Sci 2010;52:455-61.